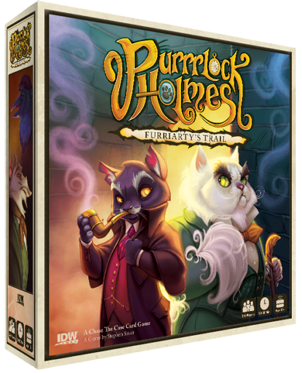 This May, IDW will release a brand new card game for young mystery fans called Purrrlock Holmes — Furriarty’s Trail (created by Stephen Sauer and illustrated by Jacqui Davis). Here’s what they say: “Furriarty is terrorizing London and he must be stopped before he completes his plans and escapes! As a newly inducted Inspector at Scotland Pound, it’s up to you to bust members of Furriarty’s gang in order to get closer to the bewhiskered baddie that’s been bullying all of Baker Street. Get ready detective, this case is officially afoot (or a paw, if you will).” What they’re not saying is: What’s the connection (if any) between this and the Purrlock Holmes series of young-reader mystery novels by Betty Sleep? You’ll know when we do! Here’s more about the game from TGN.